Tom Coughlin is the Executive Vice President of Football Operations for the Jacksonville Jaguars and a two-time Super Bowl winning coach. Most parents dream and save for their child’s future education; no parent dreams a child will be diagnosed with cancer, let alone saves for its financial chaos. But each year, thousands of children under the age of 15 will be diagnosed with cancer and their families will struggle with the impact the disease creates on their income and home life. The American Cancer Society estimated 10,590 children in the United States, alone, were diagnosed in 2018, and with this diagnosis comes a hefty price tag for the treatment. In fact, the price tag’s name and the aftermath it causes has quickly become a part of our lexicon and is known as financial toxicity. When I was head coach of the football team at Boston College in 1991, a young player by the name of Jay McGillis was diagnosed with Leukemia. 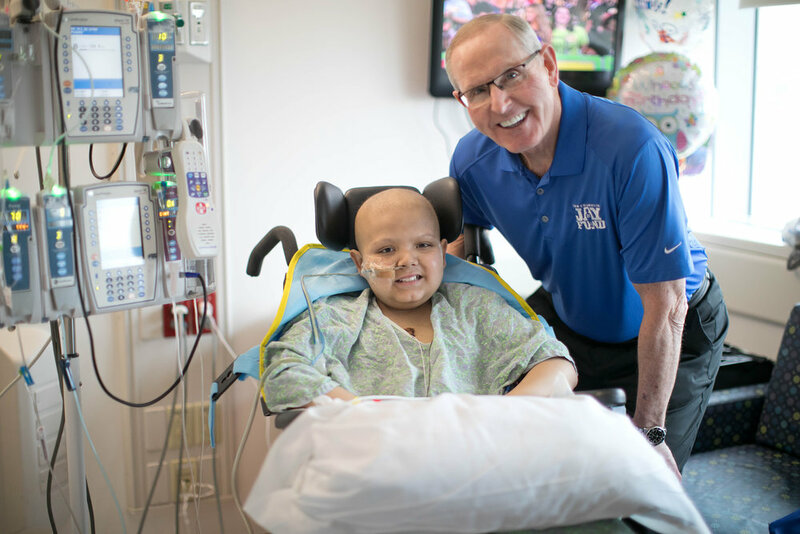 I visited Jay in the hospital on a regular basis and witnessed, firsthand, the impact this disease had on the entire family. Everyone rushed to his bedside. Family members stopped working to care for him. But the expenses continued to rise. It was soul-crushing to watch the family struggle. The football team wanted to do something to support the McGillis family so they organized a lift-a-thon and raised $50,000. It was awe inspiring how the community came together for Jay and his family. His battle brought out the best in humanity, but in the end, we lost Jay on July 3, 1992. These statistics weren’t necessarily quantified 24-years-ago when I started the Tom Coughlin Jay Fund Foundation, but the need was with every family we met and helped. Since its inception, my foundation has provided over $10 million in financial assistance to over 5,000 families. We help them keep a roof over their heads by paying the mortgage or rent. We’ve kept food on the table, the utilities going, and so much more for families facing the unthinkable, and we do it in the name and spirit of Jay McGillis. Our mission is to BE THERE for families so they can BE THERE for their sick child. So, what can families do and where can they turn to when they reluctantly become a passenger on the roller coaster ride known as cancer? I always tell parents when people offer to help, take it. No one fights this disease alone. It takes a team of doctors, nurses, caregivers, family members, friends, and organizations who want to BE THERE for you during your child’s cancer journey. Talk to the social worker at the hospital; he or she is there to help. When the Jay Fund met the Cabrera family, Magen was an eighth-grader just starting to learn about childhood cancers in science class. Her family was overwhelmed when doctors told them the then 13-year-old had acute-lymphoblastic leukemia (ALL). ALL requires between two and three years of treatment, followed by radiation. Magen’s mom and dad, along with her grandmother, either couldn’t go to work or work a full week when Magen was home from treatments. Changes to their income and mounting medical bills became a side effect of this already devastating disease. A social worker introduced my team to Magen and her parents, and they quickly became part of our Jay Fund family. We helped them financially, as well as providing financial coaching to get their finances healthy and in shape for when Magen would be well and thinking about college. They came to the Giants training facility for our annual Sundae Blitz, which is really what I like to think of as a day off from cancer for the entire family. Magen and her family met the players and ran drills with them, toured the locker room, played games, and took a few moments to breathe and enjoy each other. Today, Magen is a senior, getting ready to go to prom, graduate, and, yes, go to college in the fall. And the Jay Fund will BE THERE to support and celebrate this next phase of life with her and her family, as will the many other individuals and entities who were part of her team. Jay McGillis’s story is not unique, but it is because of him so many patients and families going through the same thing have organizations like the Jay Fund on their team. Find your team and let them BE THERE for you. To learn more about the Tom Coughlin Jay Fund Foundation, visit www.tcjayfund.org. Which Way for Childhood Cancer Funding?